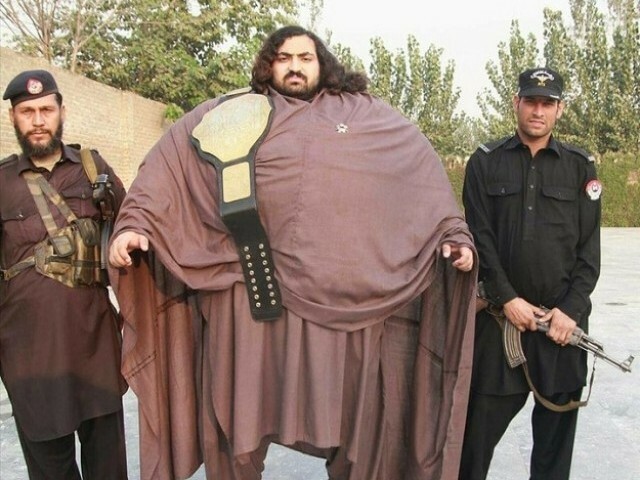 MARDAN: Weighing a formidable 436 kilogrammes, Arbab Khizer Hayat alias Khan Baba calls himself the Pakistani Hulk. When Baba turned 18, his weight started rising abruptly. He said this was due to the diet he had been taking to strengthen his body. Baba’s daily calorie intake stands at a whopping 10,000. He consumes four chickens, 36 eggs, three killogrammes of meat and five litres of milk daily to prepare for the World Weightlifting Championships. Baba hails from Mardan in Khyber-Pakhtunkhwa and claims to be the strongest man in the world. Historically, Paul Anderson of America held the title with a weight of 163 kilogrammes till his death in 1994. In 2016, American Brian Shaw clinched the title at 190 kilogrammes. “I don’t have any disease nor do I feel uncomfortable with my weight,” he said. Baba added that he wanted to gain more weight to participate in World Wresting Entertainment (WWE) competitions. Speaking about the challenges he encounters in daily life, Baba shared how he could not travel in cars.”I experience problems while travelling in cars owing to space constraints,” Baba, who owns a heavy vehicle, told The Express Tribune. When queried on his rather unsettling calorie intake and whether it could entail any adverse consequences, Baba said he consulted a doctor on that account and had a nutritional chart regulating it. Baba, who sports an overall to cover his belly and chest, hails from a well-heeled Mardan family. In 2012, Baba claimed to have lifted a 5,000 kilogramme weight in Japan using anchors. “No one can break this record,” he said. Baba also claimed that he had gotten a medal from the WWE and his name was included in the Guinness book of World Records. The Express Tribune was not able to independently verify the claims.